Brain imaging reveals that poor communication between four regions of the visual cortex that help process what we see is correlated with greater risk of mental illness. 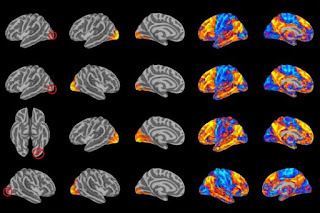 Duke researchers used brain imaging to identify how patterns of brain connectivity the ability of different brain regions to talk to each other can affect a person's likelihood of developing common forms of mental illness. Surprisingly, they found that brain regions that help process what we see may play a key role in mental health. 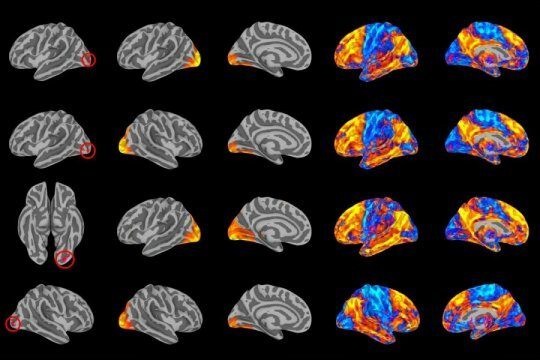 The results show that a person's risk of mental illness broadly increases when the visual cortex has trouble communicating with brain networks responsible for focus and introspection. "You don't typically associate visual processing with psychopathology,"
said Maxwell Elliott, a graduate student in psychology and neuroscience at Duke. "We found evidence that visual areas may be related to mental illness by virtue of their ability to communicate information between two higher-order cognitive networks." Teasing out how risk for mental illness manifests in the brain could help researchers target interventions and therapies to where they matter most, the researchers say. The results appeared online last month in Biological Psychiatry. In their analysis, the team drew upon data from 605 university students who participated in the Duke Neurogenetics Study. Each participant was asked to spend about 10 minutes relaxing in a Magnetic Resonance Imaging (MRI) scanner while the instrument recorded blood flow to different regions of the brain. "We measure how different areas of the brain talk to each other by how their blood flow signals go up and down together,"
said Elliott, who works in the lab of Duke professor of psychology and neuroscience Ahmad Hariri. Participants also completed a comprehensive mental health assessment, and the researchers used these assessments to estimate each individual's "p-factor" score. The p-factor reflects recent observations that people with symptoms of one psychiatric disorder, such as anxiety, are also more likely to report symptoms of one or more additional psychiatric disorders, such as depression or bipolar disorder. People who reported a greater number of or more intense psychiatric symptoms were assigned a higher p-factor score. All participants who were diagnosed with mental disorders were referred for treatment. In a study published last year, the team examined how the structure of the brain, such as the density of white or grey matter, maps onto the p-factor. They found that higher p-factor scores correlate with lower volume and less integrity of white and grey matter in regions of the brain that help coordinate complex movements with external stimuli, including visual input. In the new study, they wanted to extend this analysis to also include the brain's functional circuitry. Using an advanced statistical technique, they examined how functional connections throughout the brain related to p-factor scores. 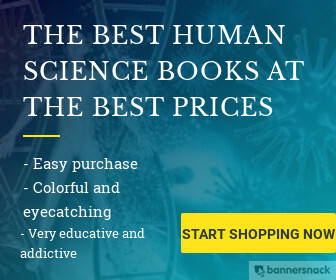 They consistently found that people with higher p-factor scores also had certain brain regions that didn't work together as well specifically four regions of the visual cortex that help us understand and recognize what we see. When they looked deeper into the data, they found that these visual networks specifically had trouble tapping into more complex networks responsible for focus, planning and introspection. Difficulty focusing and planning has been linked to severe forms of mental illness, such as schizophrenia and severe depression. "We are very visual animals compared to, say, a dog or a mouse, so a big part of our attention is focused on filtering visual information,"
"And in order to filter visual information and stay focused on a task, these higher order networks need to work with your visual networks to tell it to ignore, say, the blinking light outside, and keep giving us information about what matters most for a given task at hand." "We will never make progress in the field of psychiatry until we can understand the biological origins of these diseases in people,"
said Theodore Satterthwaite, an assistant professor of psychiatry at the University of Pennsylvania, who was not involved in the study. "What's exciting about this work is it shows that there may be common neural circuits that may leave people vulnerable to all sorts of disorders." Because measuring this circuitry is simple and non-invasive the patient merely has to relax in an MRI scanner Satterthwaite says it may have potential to be used as a diagnostic tool in a clinical setting. Both Elliott and Satterthwaite caution that the results must be replicated on a more diverse group than undergraduates before it can be considered generalizable to the population as a whole. The team at Duke plans to repeat the experiments on New Zealanders participating in the long-term Dunedin study. "The more we can map the p-factor onto the brain and understand how it influences mental illness, the more we can come up with novel ways of intervening," Elliott said.